No time to nature journal? No problem! Let’s explore the 3 easiest ways to begin keeping a nature journal so you can get started right away. The first myth about keeping a nature journal is that it must be done every day. It seems impossible to take time every day for sitting quietly in nature looking, listening and drawing. Yet, doesn’t the idea of doing so whisper to your soul? 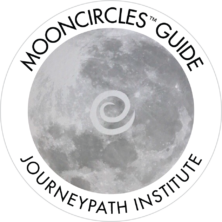 Since Nature moves in cycles and tuning in to those cycles and using them as a template for your journal provides many easy ways to establish a practice that fits into your life, keeping an on going nature journal doesn’t have to take a lot of time. 1.) First of all, creating just one nature journal page a month, focusing on things that capture the essence of that month, and you create a small, but beautiful nature journal that documents the changes in nature during the course of an entire year. 2.) In addition, you can nature journal just once a week and you fill a fifty page sketchbook in one year. Furthermore, fill a two page spread every week and your nature journal would be complete in just six months. 3.) If you went outside each evening for a few minutes and recorded the moon you would capture the entire cycle of the moon’s waxing and waning in your nature journal in a single month. 4.) Try quick sunrise and sunset studies they’re fast and easy! 5.) Create a grid of small boxes on your page and fill one each day with an simple, single object from nature. Try an acorn, a leaf, a pebble, a twig, a flower, etc. It’s amazing how quickly this will go and how beautiful your page will look. The western mind thinks dualistically. Something is this, not that. Therefore, we often make the same mistake when thinking about what is, and what isn’t nature. In truth, nature is all there is. She is all around us at every turn, in the country or in the city, above our heads and beneath our feet she is all encompassing not “out there’ somewhere. Maybe you’ve never realized it, but your backyard, large or small is nature, and I guarantee you it’s teaming with life. When nature journaling the most relevant goal is to form a deeper relationship with nature. The best place to start is the exact place that you inhabit. Get to know your own yard, the land you live on, or a local park. The closer your “sit spot” the better, as getting out there will be much less a chore so you are primed for success. Take this Action Step: Rather than traveling far afield start looking around your own yard or local park today. Find your perfect place and claim it as you very own “sit spot”, the term naturalists use for the location they will return to again and again to observe and record nature. Not knowing how to draw is actually one of the easiest obstacles to overcome., so don’t let it hold you back. The process of drawing is a cumulative one. 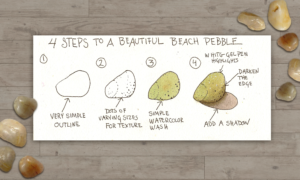 The more you draw the better you will get, consequently each tip and technique you learn along the way will broaden your abilities and enhance your skill level. Soon you’ll have experience with many approaches and techniques. You will be able to pick and choose what is most expressive and comfortable for you. Finally, there are many clear, simple drawing exercises that will help you learn to process what you see and translate that into sketches. Most of all remember, a nature journal is a living document, created on the spot, in the field. It will not look like a photo, a biological illustration, or even fine art. Your sketches will be uniquely your own, filled with life and the vitality of the moment. Join me on Facebook for much more on learning to keep a nature journal. Isn’t it time you learned how to nature journal? Because there’s a lot to learn I’ve created a course especially for you. Begin your nature journal journey today when you sign up for my online course Beginning a Nature Journal. Read more about that HERE. Yes! I have forwarded this to my sister who is wanting to join us from Sidney B C. This an enticing website! Wonderful Anita! Thanks for passing info about the course on to your sister. Glad you like my new website. HI Jan…your new website is beautiful! 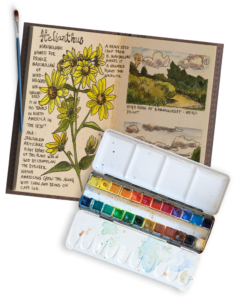 Easy to navigate, full of inspiration, and will surely bring the wonder of nature journaling to so many. Thanks for all you do! Hi Karen, I’m so excited to finally have a beautiful home for all of my offerings. I’m glad you found your way here and enjoyed your experience. I’m still tweaking this and that but I’m almost ready to have a big launch party! I don’t use Facebook but I do love looking at your website. 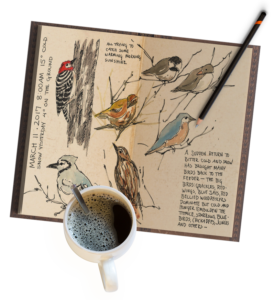 I live in the beautiful Dandenong Ranges in Victoria, Australia and love keeping a nature journal, especially of the abundant birds and wildlife around our home. Your work has inspired me so much since I found your site some time ago. Thank you. Hi Lynne, It sounds like you live in paradise! How beautiful it must be. I’m so glad you found your way to my new website. There will be much more to come including new posts and videos about nature journaling. I hope you’ll keep coming back to visit and read the blog.